Never has any test car I've driven drawn this many stares and curious public inquiring. Not even high-performance coupes from the likes of Audi, Jaguar and Porsche. Perhaps, it's because of the car's striking Kurkuma-inspired goldenish paint. Or maybe, it's because it's wearing that drop-dead gorgeous R-Line kit. 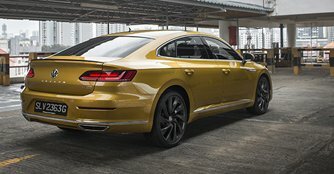 Whichever the reason, one thing's for sure - the brand new Arteon stands out. Contrary to popular belief, the Arteon isn't a replacement for the Passat CC, but instead a new contender that's intended to elevate the German marque to greater heights. Characterised as an avant garde gran turismo, the Arteon is targeted at premium-badged rivals from Audi and BMW such as the A5 Sportback and the 4 Series Gran Coupe. And the Volkswagen has proven that it's definitely not a knife in a gunfight. In R-Line guise, it's every bit as sporty as it's elegant, thanks to fanciful coachwork and a stretched rear end. 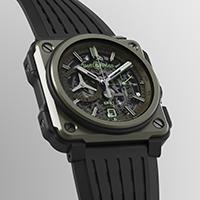 It's a departure from the brand's more restrained norm but this new style is not without practicality, either. With a wheelbase of 2,837mm, 46mm more than the Passat, it's bountifully accommodating for four adults, and reasonably comfortable for five with also plenty of adjustment for the steering wheel and seats. Its sweeping roofline does eat into rear headroom a little but it's only a problem if you're 190cm, which most Singaporeans aren't. Thankfully, the pillarless doors ease admittance and add a touch of class, while the small window in the C-pillar extends behind the shoulders of rear passengers, allowing for an airy feel to the hind quarters. Add a sizeable 563-litre boot into the equation, which is accessed by a huge hatchback and the $220,400 Arteon (as of 17th January 2018) might be seen as a desirable and rather ritzy purchase, but one that's family-friendly. While cabin design is heavily carried over from the Passat, quality of the trim, fit and finish is exactly as you'd expect in a modern luxury car. 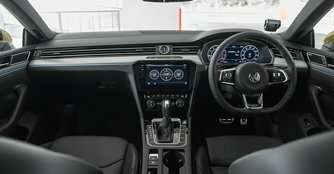 And as with all Volkswagens, everything is neatly designed and easy to operate, with the centre dash dominated by a large crisp, glass-fronted 9.2-inch touchscreen that serves up plentiful info and entertainment options. The 12.3-inch Active Info Display, which replaces analogue instrument dials with digital representations, comes standard. Extra effort has also been put in to snazz up the car's cabin with plush dashboard trims and contrasting carbon fibre-like dressing on the seats. 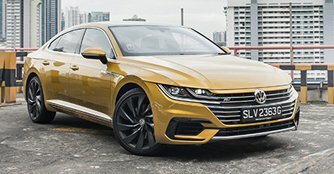 Does the Arteon have the go to match its show? 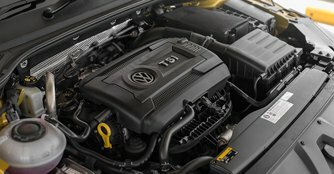 To ensure that it does, Volkswagen has called upon the Golf R power and drivetrain for the job, which means it's armed with 280bhp and 350Nm of torque that will be sent to all four wheels at the disposal of your right foot. Mated to a smooth-shifting seven-speed dual-clutch transmission, the Arteon's performance figures are just as convincing. Nought to 100km/h will take you just 5.6 seconds, just under a second short of the Audi S5 Sportback. It's a quick car but it requires anything above 2,500rpm to really get the boost going and is quite raspy when it does. Depending on individual preferences, the soundtrack is either welcoming or mildly intrusive. Still, the aural presence doesn't rob much refinement and sophistication from the Arteon. 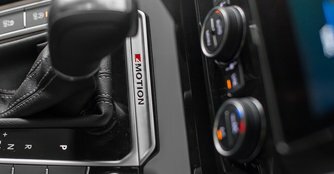 There's a grown-up feel to the way it drives and the adjustable suspension allows for a multitude of damping choices, although you'd require a really sensitive bottom to differentiate one immediate level from the next. 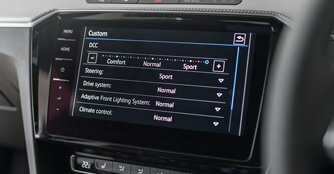 Given the speed limitations on our roads, there's no real need to put the car in Sport suspension mode either. The car's wide track already benefits stability and the 4Motion four-wheel drive brings with it plenteous, reassuring traction. The steering, too, is accurate, even if lacking slightly in feedback. However, the Arteon is after all not a car you'd want to manhandle despite how capable it is and is best enjoyed in all of its poise on long drives, soaking up imperfections in the road as a luxury car should. The only thing missing, then, is a premium badge.